Brunnera macrophylla has always been a popular shade plant because it has long-lasting sprays of bright blue flowers and because it is so low maintenance. Although Brunnera is a slow grower, the green-leaved species will eventually spread out and make a nice ground cover. The flashier variegated varieties are a bit slower to fill out, but provide interest and color all season. One of Brunner's common names, bugloss, is derived from the Greek words for "ox" and "tongue", as the leaves are thought to resemble an ox tongue. Whether or not that is true, it is true that Brunnera plants are deer resistant. It's easier to see how it got its other common name, False Forget-Me-Not. The blue flowers may have you doing a double take. Botanical Name: Brunnera macrophylla, pronounced BRUN-er-ah, with the accent on the first syllable. Plant Type: A slow-spreading, clump-forming perennial. Mature Plant Size: Brunnera is not a large plant. It forms a low mound with the height coming from the flower stalks. Expect it to reach a mature size of 12 to 20 inches (h) x 12 to 24 inches (w). Many of the cultivars will spread less quickly than the species. Sun Exposure: Plant in partial to full shade. Brunnera can grow in full sun, but it will need more moisture. The variegated leaves can easily burn in direct sunlight and plants may go dormant in extreme heat. Bloom Time: You will start to get sprays of blue flowers in mid- to late spring. Brunnera can stay in bloom for about 4 weeks. Flower Color: The delicate, 5-petaled, blue flowers come in sprays held above the foliage. They range from pastel to electric blue, often with a yellow center. Leaves: The first leaves of the season tend to be oblong, but later leaves are heart-shaped, slightly puckered and many have a tendency to curl or furl. They can be a solid deep green or variegated or spotted with silvery-white tones. Hardiness Zones: Most varieties are hardy in USDA Zones 3 - 9. Native Area: Siberia and parts of the Mediterranean but has not become invasive when grown in other areas. Brunnera is not particular about soil pH, but it does like rich, moist soil. Lots of organic matter and an organic mulch will help it become established quickly and keep it growing well. Only the species Brunnera macrophylla will grow true from seed. Start the seeds in fall, if you want blooms the first season. When the plants are in good growing conditions, they will self-seed on their own. Brunnera cultivars are started as plants. Although they will set seed, they do not grow true to seed and the resulting plants will not necessarily look like the original plant. Brunnera plants prefer rich soil but do not require supplemental feeding, as long as the soil is not too poor or dry. Keep new plants well watered. While Brunnera plants prefer constant moisture, they will become more drought tolerant once they are established. Mulching will help maintain the cool, moist soil that Brunnera prefers. Brunnera "Diane's Gold" - Golden-yellow leaves and blue flowers. Brunnera "Hadspen Cream" - Large leaves with irregular white outer margins. Brunnera "Jack Frost" - Silvery leaves with green veins. Brunnera "Langtrees" (aka "Silver Spot") - Leaves are dotted with silver. A very hardy plant. Brunnera "Looking Glass" - Silver leaves look almost metallic. Brunnera is also a great choice for containers. The variegated leaf varieties will make a nice filler throughout the season. Many are hardy enough to remain in containers throughout the winter, with a little extra protection. Use Brunnera in shade gardens, woodland settings, and near ponds. It can make a great ground cover and looks beautiful lining a path or border, although it can take a while to fill in. 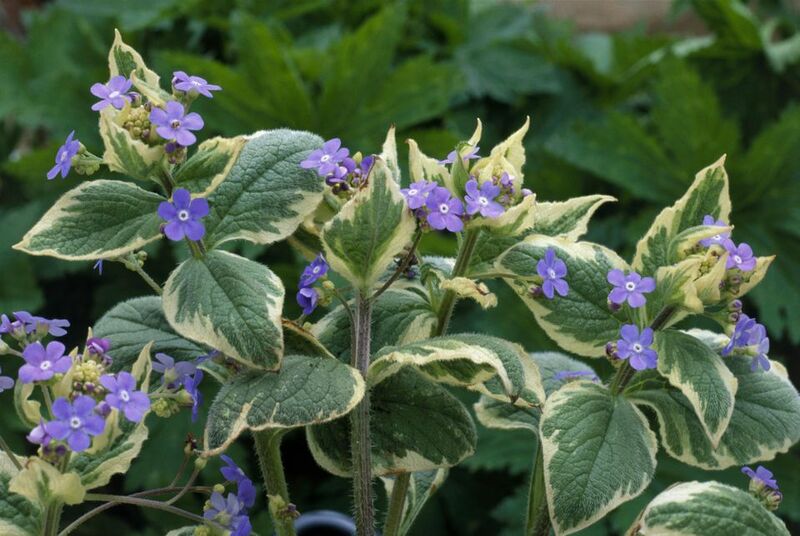 Since deer and slugs do not often bother Brunnera, it makes a nice alternative to Hosta. Companions with different textures and leaf shapes include Hellabores, iris, hostas, bleeding heart, geraniums and even late blooming daffodils. The older leaves may start to get tattered and can be cut back during the growing season, to encourage new leaves to fill in. Don't cut the whole plant back to the ground in the fall. The leaves will help protect the crown during winter and you can easily prune the plant in the spring when the new leaves begin to emerge. If you do not want your plants to self-seed, deadhead as the flowers start to fade. If you would like to collect the seed to sow, allow the flowers to dry slightly, then cut and let then finish drying in a paper bag. The seeds will fall off as the flowers dry. Divide in early spring. Brunnera can be short-lived and dividing your plants about every 3-5 years will keep them around longer. Since Brunnera prefers cool, moist shade, slugs may become a problem, but varieties with thicker leaves are rarely bothered.